There is no greater way to expand the understanding and empathy of people towards those not like themselves than by finding a story which becomes common ground. That’s perhaps the simplest way to “put a face” on an issue which may not otherwise resonate with the majority. That may also be the most important factor in the newest venture at the Pasadena Playhouse. In Diana Son’s “Stop Kiss,” there are two central themes: the gradual development of a strong relationship that solidifies into love, and a violent act which rips the warmth from that story yet also does much to solidify its definition. The two themes unfold at the same time, allowing the audience to process both violation and relationship in an intertwined, very powerful way. In essence, the tale is one of Callie, a long-time New Yorker, and the friend-of-a-friend newly moved from St. Louis, Sara. Callie’s social life hangs upon her college relationships, as she surfs a high profile but unsatisfying job and lands the perks of “who you know” as a city-dweller. Sara brings with her an idealism, having received a grant to spend two years teaching 3rd grade in the Bronx, and a sense of forward motion Callie has missed. The two click immediately, becoming fast friends moving slowly but inexorably toward something more. Then, at the moment of transition, their world shatters in a hate crime. Angela Lin makes a genuine, worldly yet innocent Callie, secure in her world, yet still searching for meaning and connection. 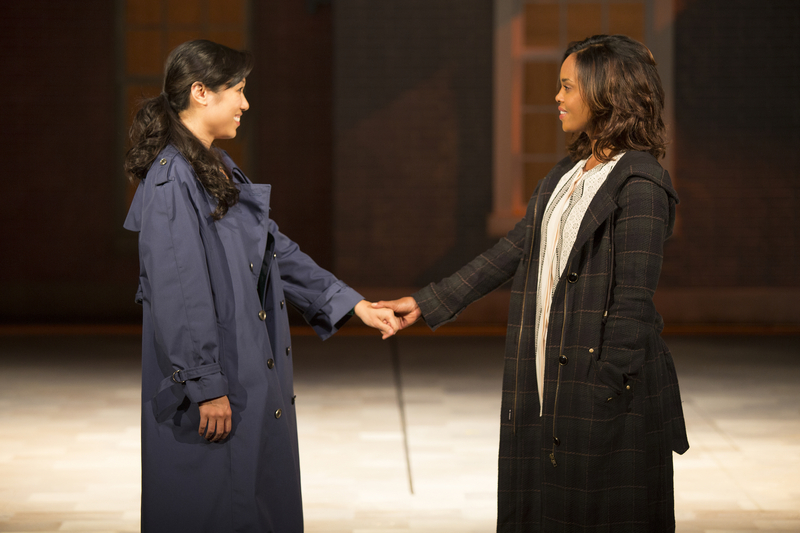 Sharon Leal exudes a personal confidence as Sara which, even though counteracted by her initial sense of being a New York outsider, leads to an expansion of both her own and Callie’s view of their worlds. As Callie’s guy friend and occasional bootie call, John Sloan provides the symbol of her life before the play begins – one lived at arms length from true emotional connection. Brandon Scott, as the young man Sara left behind, provides a view of her own, solidly Midwestern, interconnected roots. Jeff de Serrano offers up the classic detective, hammering for facts and thus making Callie face home truths. Amanda Carlin, though also a hospital nurse, makes the most impact as the witness to the attack who calls police: empathetic but from a distance. Director Seema Sueko uses David F. Weiner’s easily shifting set pieces to switch back and forth from the charm of a New York apartment to the chill of a street with great swiftness, keeping the pace going and thus the two tensions moving as well. In this play, performed without intermission to also avoid a break in the elemental flow, this proves key. Combine that with the charm, the sheer likability of the two main characters as portrayed, and one simply cannot look away. In the end, the responses of everyone onstage achieve a natural quality which may even be the point, but certainly lets the dramatic endings sync together like a resolved fugue. “Stop Kiss” was written in 1998. What is both warming and sad about that fact is that the very scenarios described therein could happen today, 16 years later. Some of what is discussed is, for the traditional Playhouse audience, a bit controversial. Yet, that is not at the core of why one should see this lovely piece. Love, trauma, shattered dreams, and new realizations are foundational to many beloved moments in the theater. The themes do not change because the characters are different. But then, of course, seeing them applied to these characters offers a chance to find that face, albeit a fictional one: that character (or characters) which can humanize an issue, and create the very empathy which brings an understanding and helps a society to move forward. Seems a tall order for a small relationship play, but it could be a start. This especially when the production is as fine, as moving, and as meaningfully intense as the one at Pasadena Playhouse.